Note: For a more current taste review on a tweaked bag design, open up McLean Clean & Lean – Traditional Beef Jerky (Review #2). 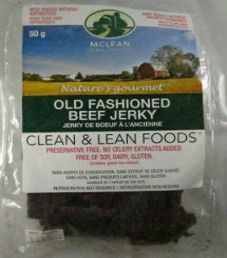 The next review for McLean Clean & Lean will focus on a 1.76 ounce/50 gram bag of their old fashioned flavor. 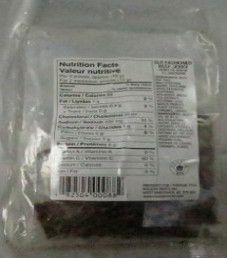 This bag was purchased at a Goodness Me organic grocery store in Burlington, Ontario, Canada. Ingredients: Beef, Sea Salt, Maltodextrin, Sugar, Spice and Spice Extracts, Dextrose, Molasses, Green Tea Extract, Ascorbic Acid, Garlic Powder, Yeast Extract, Caramel, Smoke. Old fashioned is really the perfect name for a flavor here, old fashioned style jerky with no liquid marinade. Another term is a dry rub, as opposed to gourmet jerky, which uses a liquid marinade. There are healthy spice and spice extracts used. The sugar level is very impressive at only 1 gram of sugar per 28 grams of jerky. The salt level is reasonable at 260mg of salt per 28 grams of jerky. As advertised, this jerky contains no sodium nitrite as a preservative. It is great to see that sea salt is used instead of just plain table salt, where salt is the main preservative. Ascorbic acid, a form of Vitamin C, acts as a preservative also. Cleverly, green tea extract is used as a preservative, utilizing the antioxidants. Green tea has a very long history in medicine providing many health benefits. Most of the pieces of jerky are small in size, with about a medium thickness. 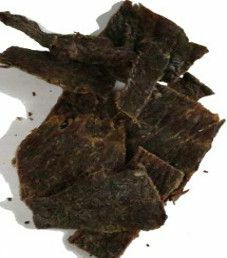 The texture is dry, but not too dry, which results in jerky that is relatively easy to chew. There are no signs of fat, and handling this jerky leaves no oily residue on your fingers. At first, the jerky tastes non-descript. Then some of the flavors begin to develop. 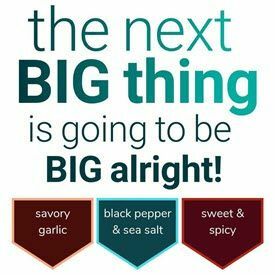 More than anything, the actual natural beef flavor stands out the most, the way an old fashioned flavor should taste. While not that salty of a jerky, the salt taste perhaps stands out the most. This jerky is in no means sweet tasting. There is a certain pleasant blend of flavors. This 1.7 ounce/50 gram bag was purchased for $3.99, which works out to $2.34 an ounce. That is a borderline average price. This jerky is highly recommended to anybody who prefers the actual jerky beef flavor, and not some overpowering type of flavor. There are high quality ingredients used. This bag is not resealable, and you need a sharp object to open it. There are labels affixed to both the front and back of this transparent bag. 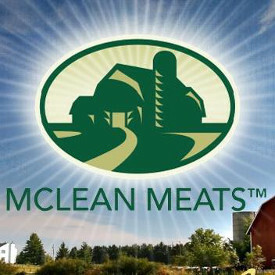 On the front label, there is the McLean Clean & Lean logo of a farm, on top of a scenic picture showing a farm and the surrounding land. There are two trademarked slogans: “Nature’s Gourmet” and “Clean & Lean Foods”. Other facts printed are “Beef Raised Without Antibiotics”, “Beef Raised Without Growth Hormones”, “Preservative Free, No Celery Extracts Added”, “Free of Soy, Dairy, Gluten” and “Contains green tea extract”. All of the important bag categories are covered. There is no description about McLean Meats Inc. but in fairness there is no free space. For all jerky bags packaged in Canada, French translations are required.